Any deal that you create can be linked to a contact (both companies and people) both during the time of creation or later on. The contact with whom the deal is linked can be changed at a later stage as well. Start typing the name of the contact with whom you would like to link the deal in the contact field. 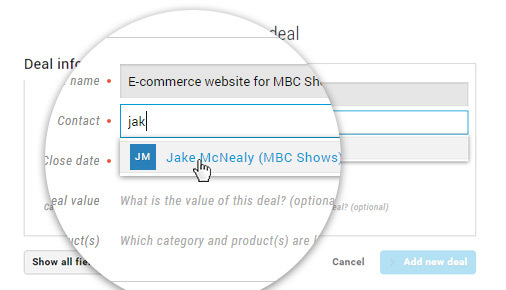 Select the required name from the auto-complete list.If the contact does not exist yet, you can enter the full name of the contact. This contact will be automatically created and linked to the deal. Your deal has now been created, and linked to the required contact. You will be taken directly to the deal. Click on the down arrow to open ‘Additional Info’ which will show further fields such as ‘Related Contact’, ‘Responsible’, etc. that can be edited. Select the contact from the auto-complete list that will show the contacts. Your deal is now linked to the new selected contact. 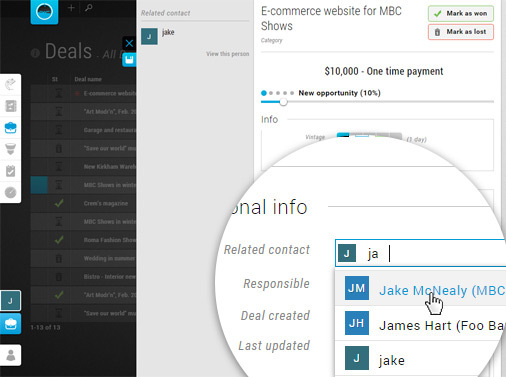 You can also create a deal directly from the contact itself, by opening a contact and going to the ‘Deal’ tab. In such a case, the Contact field would be already filled in when the deal is being created, and the deal would be linked to the required contact.